Nothing seems to be as trendy right as the ancient tradition of practising yoga. The traditional practice of yoga has stretched itself over the decades to appeal to as many people possible. It has been influenced by some rather unusual fitness fads. Yoga is continuing to embrace the current trends of health, wellness, and fitness. Below are some the offbeat and fun yoga trends that are emerging in 2018. 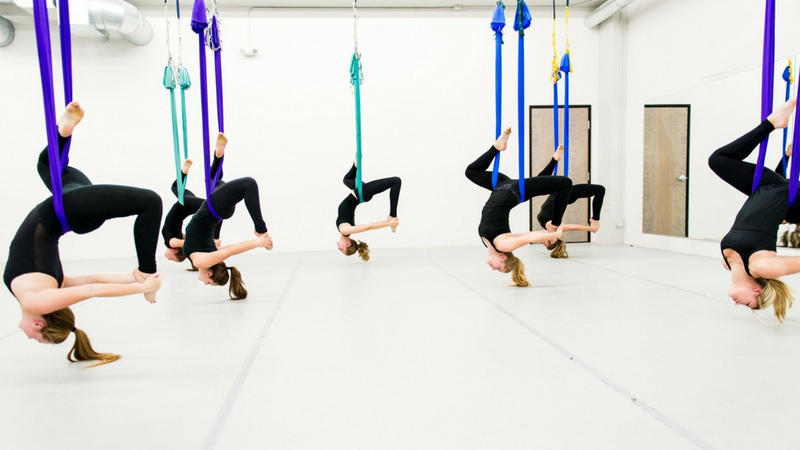 Aerial yoga is emerging as a big trend in 2018. Aerial yoga uses lots of moves from floor-based yoga but uses the hammock like a strap or a block to support the body. It helps in improving balance and strengthening the practice. It also provides balance, improves flexibility and strength, and grows confident in practicing inversions. Aerial yoga elongates and decompresses the spine, calms the mind and invites conscious playtime. Goat Yoga is usually practised on farms. It involves Nigerian Dwarf goats roaming about around yogis who practice their exercise routines. Goat yoga is definitely a stress-buster. With the success of goat yoga trend, studios are looking for ways to create their own animal yoga concept. Dog Yoga helps people to increase bonding with their dog. On the other hand, Cat yoga takes place in a studio filled with cats, who will roam free during class. The presence of these animals creates feel-good hormones, lower anxiety, and reduces loneliness. Recently many people are inclining towards yoga but want to get out of the studio. In the past, the trend was beach yoga but it poses many challenges. So, rooftop yoga is the solution for those who want the enjoyment of an outdoor practice and spectacular view. The popularity of rooftop yoga is on a new high, especially in cities where rooftops are plentiful but outdoor green space is not. Various yoga studios have been teaming up with hotels and other building owners to bring this unique experience to their students. Pole Yoga is a recent fitness fad which is getting widely popular among millennials. It combines the strength of yoga with the athleticism of a pole dancer. It’s associated with themes of empowerment and body positivity. It helps to build up core strength and flexibility. Various celebrities such as Jacqueline Fernandez and Varun Dhawan are indulging into pole yoga. Tantrum yoga is a new yoga trend which enables the adults to tap into their inner child and let out frustration and anger in a healthy way. It encourages the yogis to scream and shout their way to better health. The aim is they will be laughing and relax by the end of the class. It helps the practitioners to release their stress by throwing a temper tantrum. Kundalini is one of a kind yoga style which is surging in 2018. Kundalini yoga is an uplifting blend of spiritual and physical practices. It incorporates movement, unique blend of physical postures, dynamic breathing techniques, meditation, stretching, and the chanting of mantras. This activates the glandular system, strengthens the nervous system, expands the lung capacity, and purifies the bloodstream. The main aim of this yoga style is to build physical vitality and increase consciousness.